Forest Glen defines convenience. The gated and 24-hour guarded main entrance is only a mile south of Interstate 75 Exit 101 on Collier Boulevard. That makes Forest Glen convenient to Naples, the Gulf of Mexico beaches, Marco Island, Southwest International Airport, Ft. Myers, and even Ft. Lauderdale and Miami. Forest Glen’s immediate neighbor across Collier Boulevard is Cedar Hammock Country Club. Most of the 630 acres is nature preserve, providing a buffer around the entire community, keeping outside noise to an absolute minimum. The Villas at Forest Glen are two and three-bedroom floor plans ranging in size from 1,534 to 1,688 square feet under air. Two bedroom plans along Periwinkle Way also have a den. Most villas have private, screened pools. Barrington, located along Forest Glen Boulevard and the 6th hole of the golf course, features coach homes with barrel tile roofs and paver drive and walkways. Barrington has its own 40-foot neighborhood pool in a secluded and lush setting. Barrington’s villas feature two and three-bedroom plans with 1,185 to 2,193 square feet. Bishopwood is divided into East and West. Bishopwood East has 16 two-story buildings with six condos per building. These residences have detached, single-car garages and spacious, screened lanais. 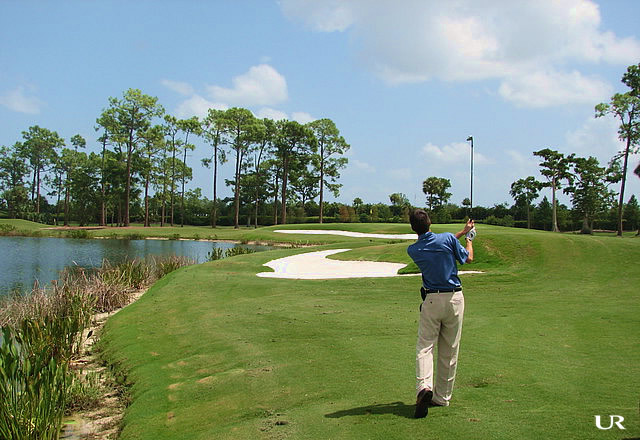 The neighborhood is tucked between four lakes and three holes on the golf course. The two-bedroom condos have living space from the mid-1,200 square feet range to nearly 1,600 square feet. Bishopwood West is a neighborhood of attached villas with one and two-car garages. Two and three-bedroom plans have living areas ranging from 1,869 to nearly 2,200 square feet. As with the other villas in Forest Glen, roofs are barrel tile and driveways and walkways are constructed of pavers. Both Bishopwood neighborhoods have pools for their residents. The condos of Britannia line the Loblolly Bay Drive. There are 16 units on four floors of the nine buildings along this meandering cul-de-sac street. Each condo has reserved, covered parking spaces. While the view from each unit overlooks the golf course, the other side of Loblolly Drive is seemingly endless preserves. These two-bedroom, two-bath condos range in size from 1,185 to more than 1,300 square feet. The 18 elegant single-family homes are all located on the secluded Jungle Plum Drive West. Each home has a private, screen pool. Floor plans average more than 2,000 square feet and are available in two, three, and four-bedroom models. The championship caliber, 18-hole, Arthur Hills & Steve Forrest course features “a carpet of Sea Isle Supreme Paspalum grass” known for its dark green and its ability to hold the ball at the top of the turf. The modern clubhouse offers some of the finest dining in Naples and Southwest Florida, including lunch, dinner, Sunday brunches and Forest Glen’s own Seafood Extravaganzas. The Forest Glen amenities also include four lighted Har-Tru tennis courts with canopied benches and windscreens. The community pool features lap and swimming areas suitable for family members of all ages. Forest Glen is a bundled-golf community, so all of the membership perquisites and amenities are included with the purchase of your new home.